Perfect PIE CRUST, APPLE PIE FILLING and a DUTCH APPLE PIE recipe. We have more apples than we know what to do with right now, so you won't have to guess very hard at what I've been doing lately. Yep. Making and freezing pie crusts, apple pie filling, and baking pies. 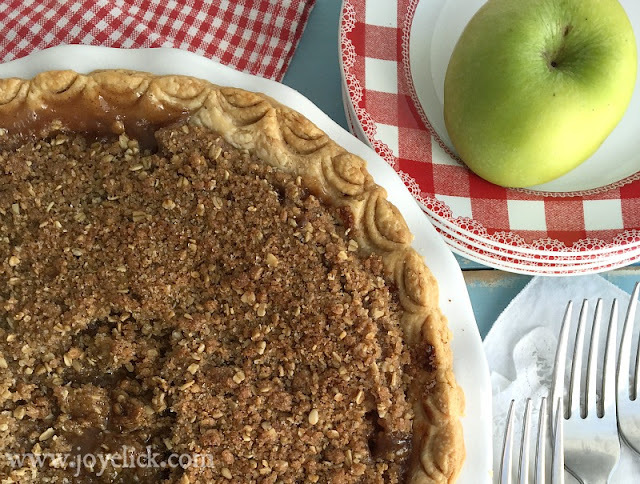 Today, I'm going to share with you an apple pie filling recipe, plus a recipe for fabulously flaky pie crust and delicious crumb topping. Put these all together, and what do you get? The most amazing Dutch apple pie ever! This is by far my favorite season of the year. 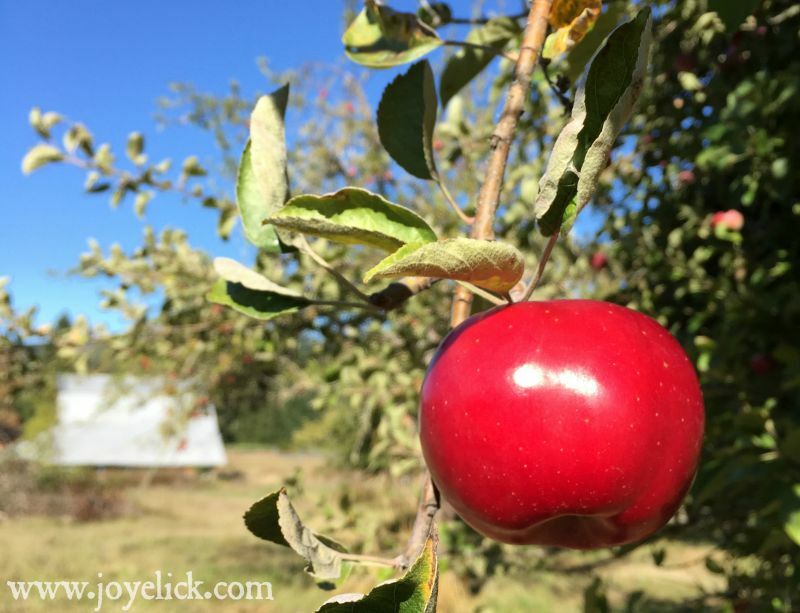 Not just because of the vivid blue skies and brilliant crimson colors, but also because autumn is when my favorite apples are ready for picking--late maturing, tart apple-pie-apples. (I wish I knew what kind we have growing on our trees, but I don't, so I just call them apple-pie-apples). When we bought our farm, we inherited an old organic apple grove (8 trees) that still puts out amazing organic apples. (I may not know what varieties any of them are, but I know one thing--they taste fantastic)! I don't know about you, but autumn makes me feel cozy and homey. There's just something about this season that puts me in a baking mood, you know! Just look at them apples! (They're not all perfect, but there's plenty that are worm-free and very tasty)! 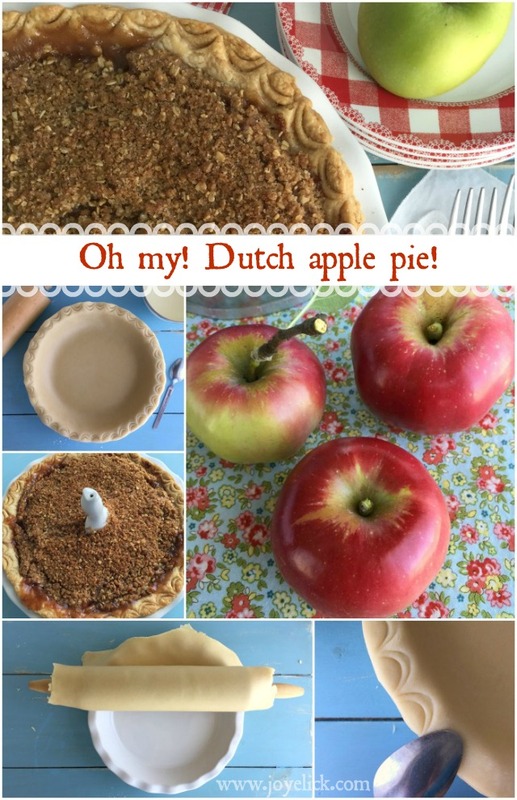 Whether you have apples you grew yourself, or apples you purchased, today's Dutch apple pie recipe is a great way to use them! So let's get started, shall we? First, let's talk crust. Did you know pie crusts freeze super well? 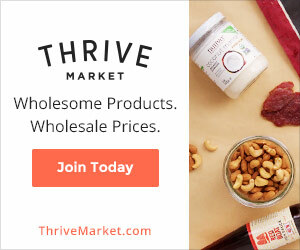 Why not stock up? Step 1: Cut in the fat. 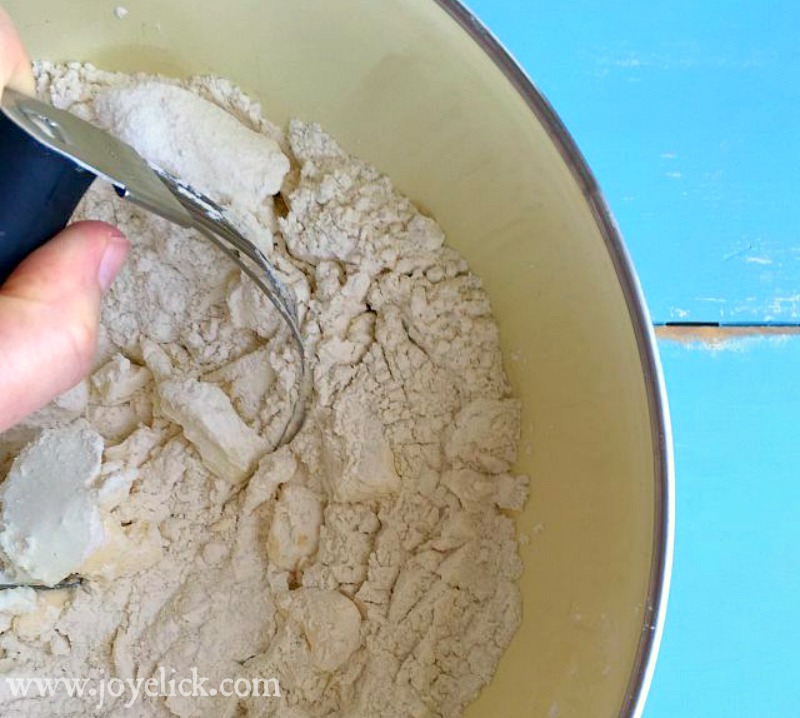 Combine the flour and salt in a large bowl. Using a pastry cutter, cut in the butter and lard until the mixture resembles coarse meal. You may need to finish combining by rubbing any last lumps between clean palms. Step 2: Add the water. Sprinkle the cold water over the flour mixture, 1 tablespoon at a time. Cut the liquid in using two knives until just combined. 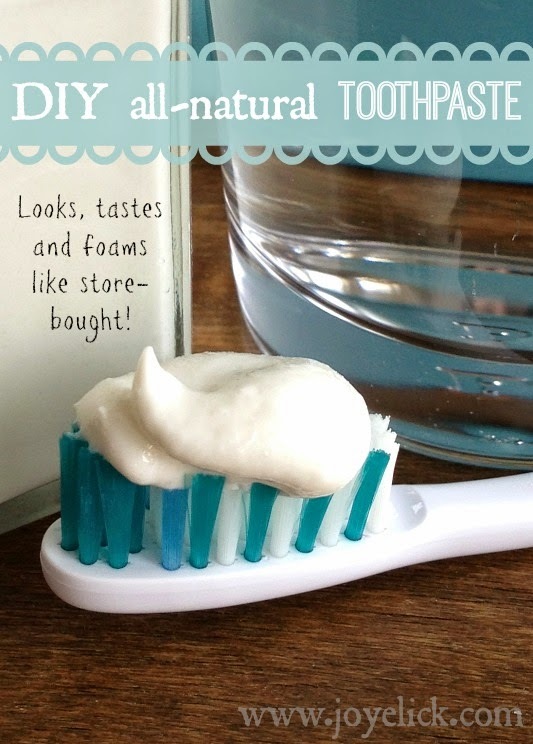 When there's enough moisture, the mixture should start to hold together when squeezed. Step 3: Wrap and chill the dough. 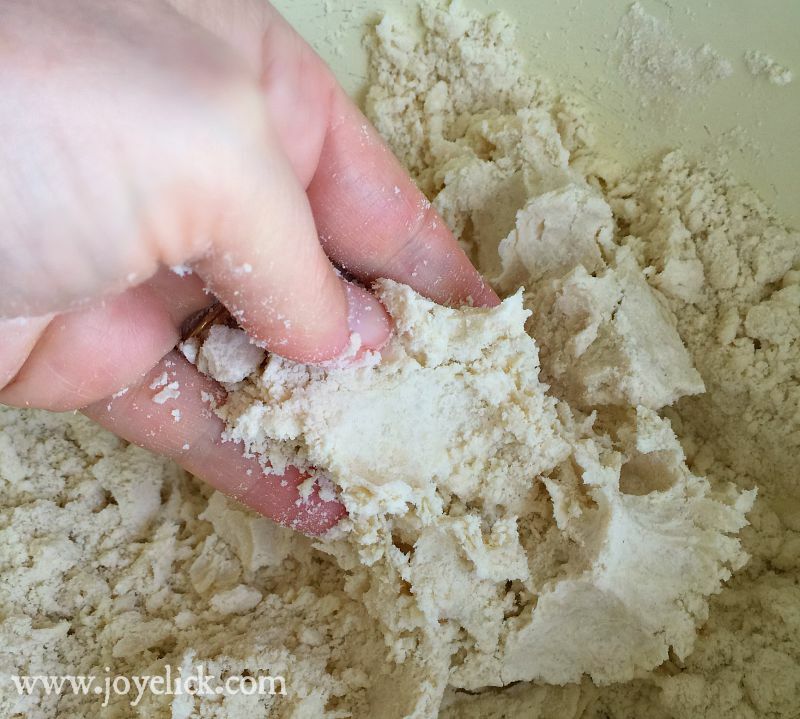 Gently knead the dough together until it forms a ball. (Be careful not to over knead). Wrap the ball tightly with "safe" plastic wrap and chill in the refrigerator for at least 15 to 30 minutes, but longer is better. 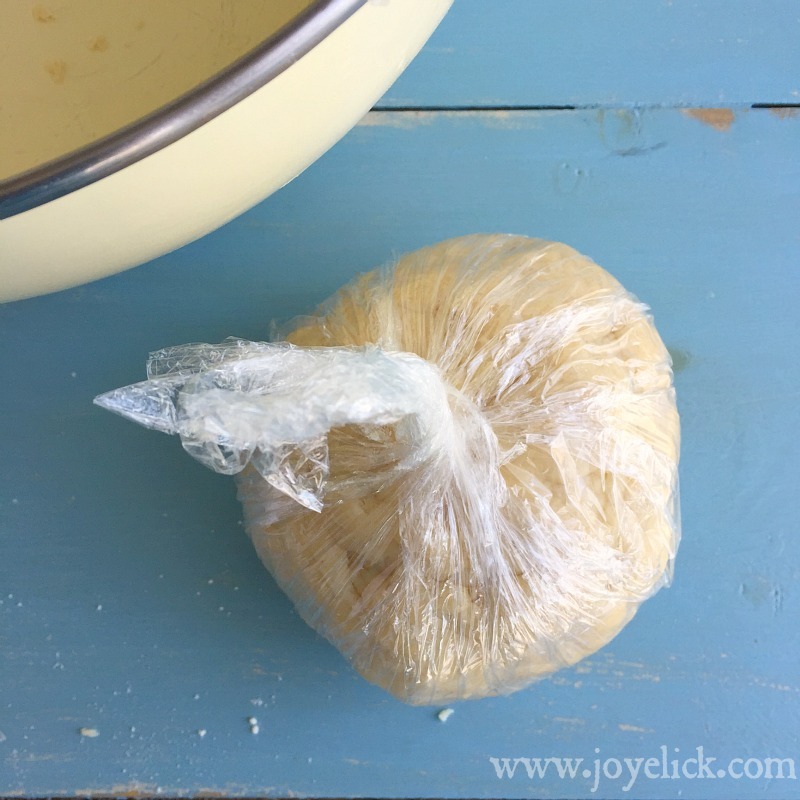 (The dough can be refrigerated for up to 2 days, or frozen for up to 3 months). Step 4: Preheat the oven to 450 degrees and position the rack in the center. Remove the chilled dough from the fridge. Let it stand on the counter for about 5 minutes. Sprinkle a bit of flour (sparingly) over the surface where you'll roll the dough. Using a rolling pin that's been dusted with flour, flatten the ball into a disk, then roll it out evenly to about 2 inches larger than your pie plate, and 1/8 inch thick. 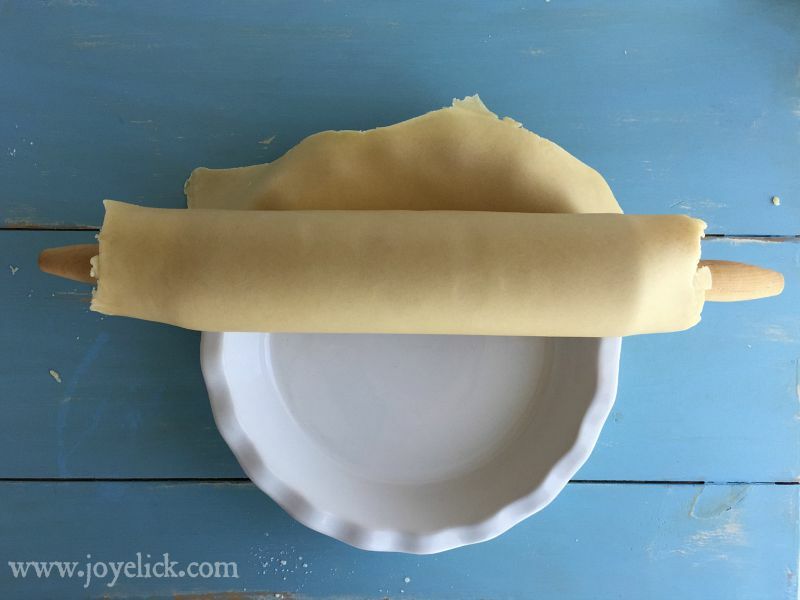 To transfer to the pie dish, roll the dough onto the rolling pin, center it over the dish, then unroll it. Pat the crust into the dish so it fits snugly into the contours. Trim the edge with scissors. Step 5: Decorate the edge of the crust. To do the edge in the image below, I simply pressed the edge of a spoon into the dough to form a double row. Looks sort of lacy and pretty, don't you think? Place the dish with crust in the fridge for 30 minutes. Chilling the crust before baking will help prevent shrinkage. Step 6: Pre-bake the crust. 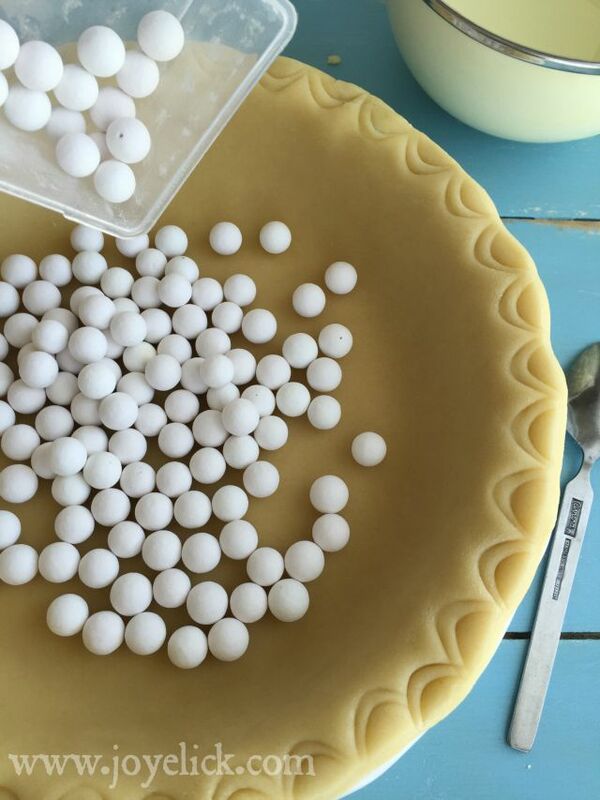 In today's recipe, we will pre-bake our pie crust before adding the filling. (If your making crusts to freeze, you would only pre-bake the crust upon removing it from the freezer, and only when a recipe calls for it to be pre-baked. To pre-bake a frozen crust, remove from freezer, let thaw on the counter for 15 minutes, prick the bottom and sides with a fork, add pie weights and bake for 10-12 minutes at 450 degrees). So let's pre-bake today's crust, shall we? 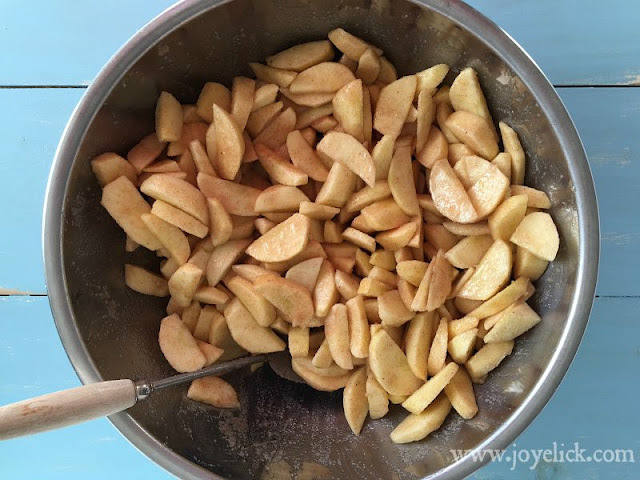 This is to help ensure that the bottom of the crust cooks fully, since we'll be using cooked apple pie filling (below) and a shorter cooking time than we would if we were to use freshly cut apples in our pie. (You've already pre-heated the oven, right)? Remove the chilled crust from the fridge. Prick the bottom and sides with a fork, then place ceramic pie weights evenly over the bottom of the dish. These weights will help the crust not buckle or puff up, and will help reduce shrinkage. Bake the crust for 10-12 minutes at 450 degrees. Let the crust cool before filling. Now that our crust is done and pre-baked, while it cools, let's move on to our filling. This recipe is what I use when I want to stock up on apple pie filling. I freeze it in pint-size jars. When I make a pie, I use my pre-made jars of filling (fully thawed). 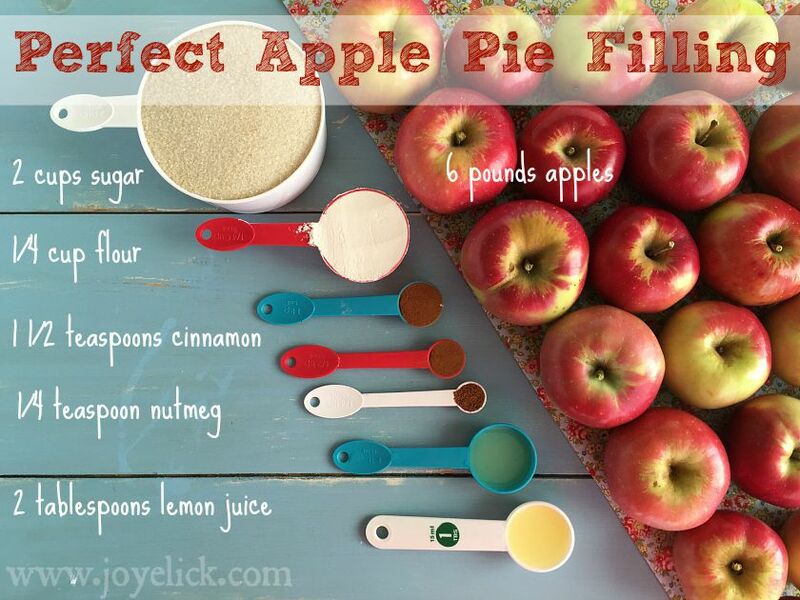 So along with stocking up on pie crusts (above), you can use this recipe to stock up on apple pie filling too. But if you want to make only one pie, simply cut this recipe down to 1/3 (or if it's easier, to 1/2 and you'll have a little extra for a few hand pies). Step 1: Begin with quality apples. This may seem silly to say, but actually, it's the most important step toward making a really good pie. You just have to start with great apples. Make sure your pie apples are fresh, firm, and of a tart variety, such Granny Smith, Gravenstein, Jonathan, Jonagold, or Pippin, for example. 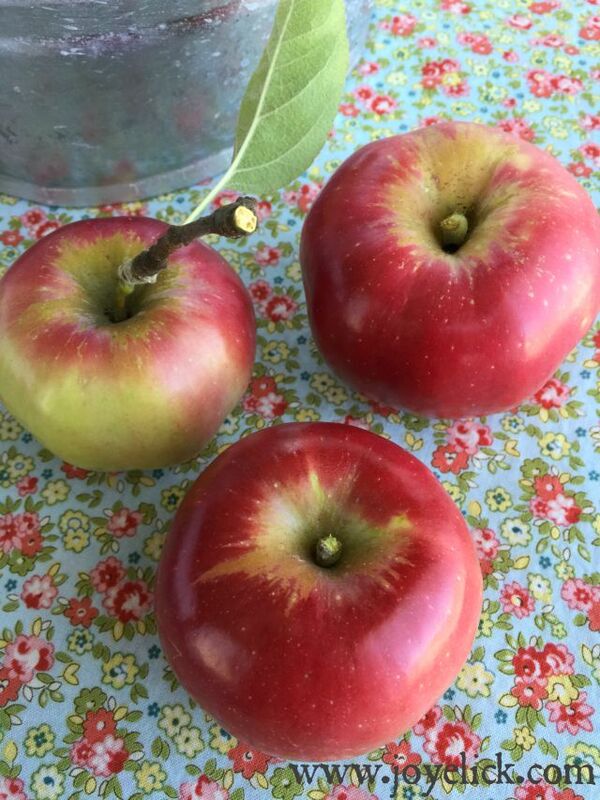 Of course, you can use sweeter apples, such as Fuji or Braeburn, too. Apples to avoid would be Red Delicious and Golden Delicious, as these are softer apples that won't hold up well when cooked. Step 2: Slice and peel the apples. First, prepare a bowl with 1 quart water and 1 cup lemon juice. You'll place your sliced apples in this solution to keep them from browning. I like to use an apple slicer when cutting and peeling the apples. 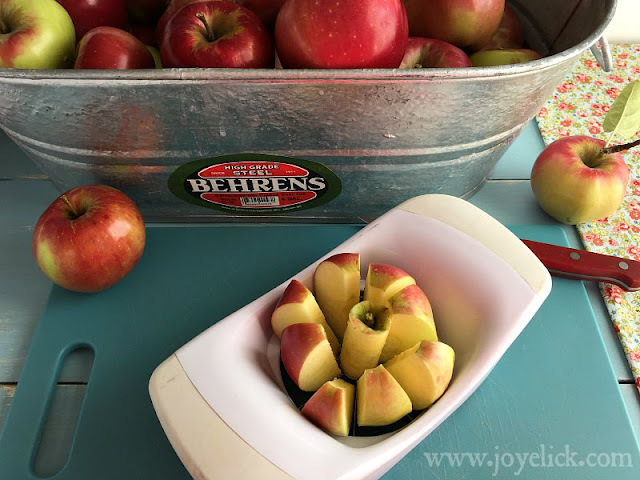 This tool cuts out the core and leaves you with neat slices you can peel in a jiff with a paring knife. Each slice should be cut again lengthwise a couple times for the proper thickness (about 1/4 inch). As soon as you finish each slice, drop it in the bowl of lemon water. 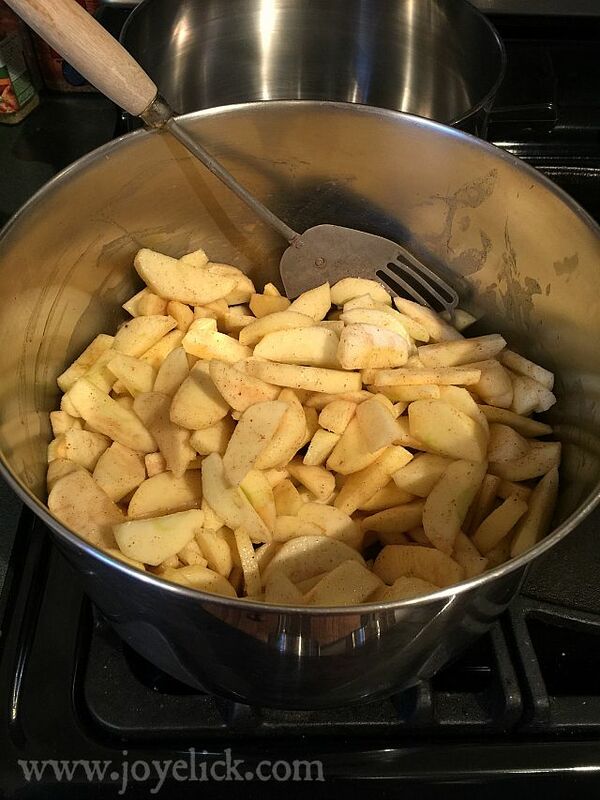 I think the lemon water adds to the good flavor of my filling, so I leave the apples here until I'm ready to drain the whole lot and move on the next step. Step 3: Combine the apples with the dry ingredients. In a large bowl combine the sugar, flour , cinnamon and nutmeg. 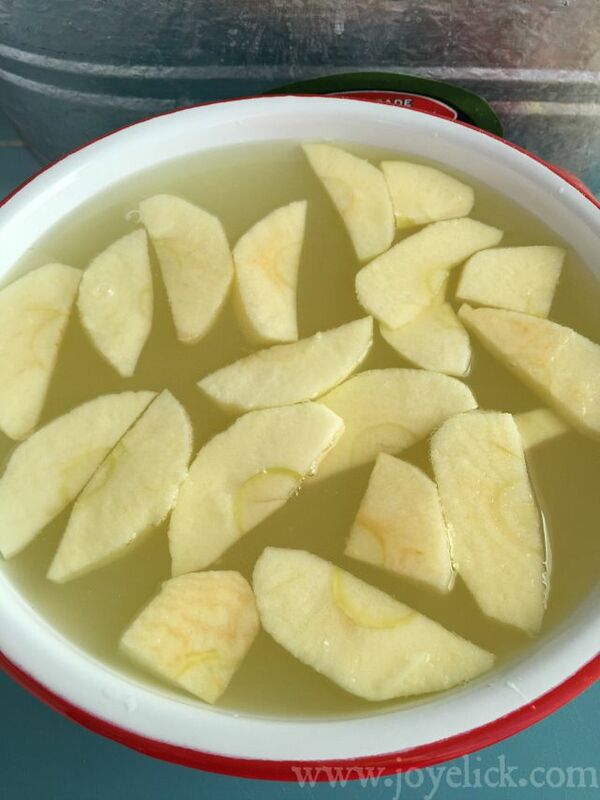 Drain the apples from the lemon water (really well) then place the apples in the sugar mixture. Stir them in so the apples become thoroughly coated in the sugar mixture, and no sugar mix is left un-moistened. Allow the apples to stand for about 30 minutes (until juices begin to run in the bottom of the bowl). Step 5: Cook the apples and juices. Add 2 tablespoons lemon juice to the apple mixture. Over medium heat, cook the whole mixture, stirring frequently, until you see the juices thicken. Remove from heat and ladle into pint-size or quart-size jars. Makes approximately 6 pints, or 3 quarts. I like to freeze my filling in pint-size jars, so I can use 1 jar to make a few hand-pies, or 2 jars to make a full pie. Step 6: Freeze or make a pie. Now that your filling is done, you can use 4 cups (1 quart) to make a Dutch apple pie (below), while freezing the rest. Be sure to leave 1/2 inch headspace in each jar for freezing. Cool the filling to room temperature (no more than 2 hours), then label and freeze. Now let's make some Dutch apple pie! The crumb topping in this recipe cooks into a delicious semi-solid top crust that's slightly crunchy and melt-in-your-mouth good. (This is by far my families favorite crust for apple pie)! To help prevent the juices from spilling over in my oven, I use a pie funnel, just as I would with a double-crust pie. 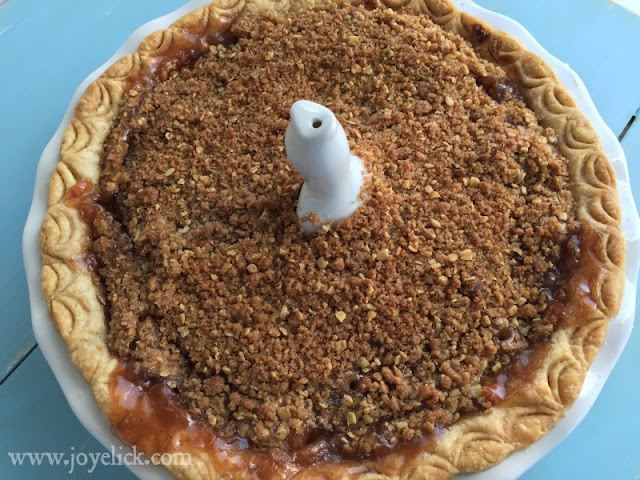 Since the crumb crust cooks into a mostly solid mass, the pie funnel allows steam to vent out through the funnel, saving myself from having to clean a big mess. Step 1: Preheat oven to 375 degrees. Oven rack should be in the center position. Step 2: Cut butter into dry ingredients. In a large bowl, combine all dry ingredients for the crumb topping. Cut the butter into cubes and sprinkle over the dry mix. (Butter should be cold). 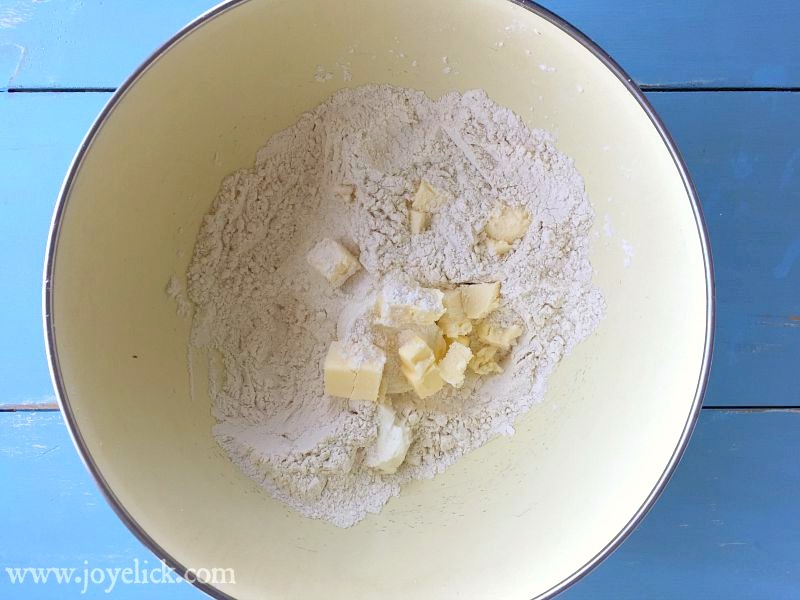 Using a pastry cutter, cut the butter into the mix until thoroughly combined. You can work the last lumps in by rubbing them between clean palms. When done, the mix should look like coarse meal. Step 2: Fill a pre-baked pie crust with prepared (cooked) apple pie filling. (See above for instructions on pre-baking the crust). 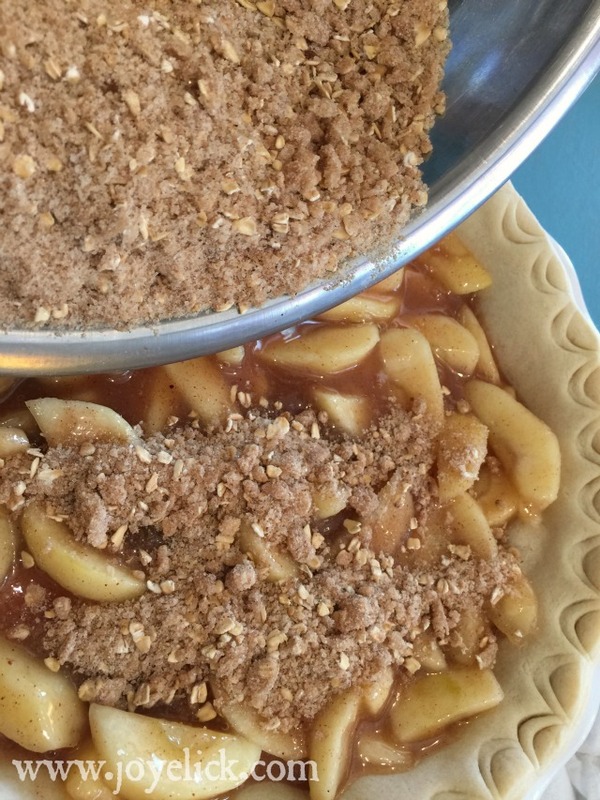 Because we are using cooked apple pie filling, there's no need to partially bake the apples (to ensure they cook fully) before adding the crumb topping. Because of this, over-all cooking time is shortened, which should prevent over-browning of the crust edges or the topping. (However, if you're worried about over-browning, you can cover the pie loosely with foil). Pat the crumb topping smoothly over the pie. Step 3: Bake for 45-50 minutes at 375 degrees. Makes 8 servings. How to make GRAPE JUICE in a steam juicer. Oh my goodness! 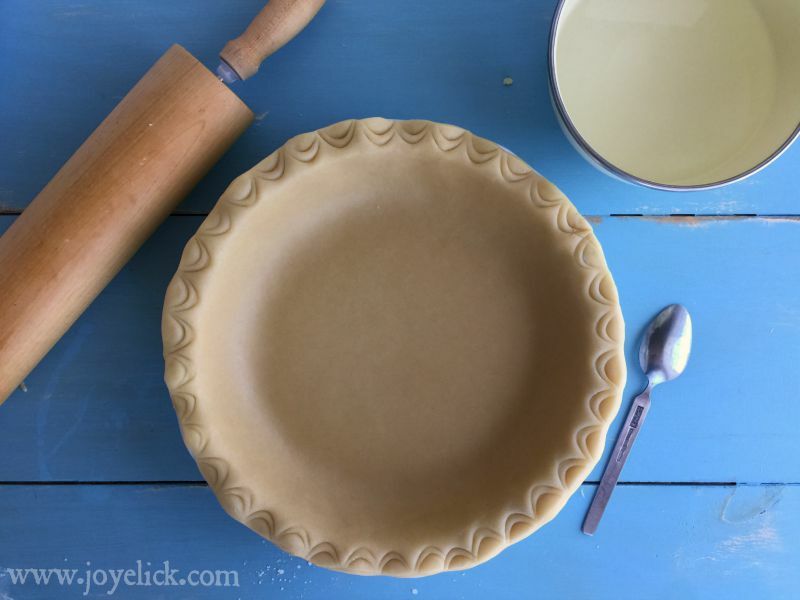 Do you know how much I have been wanting a perfect pie crust recipe. My neighbor makes the best pies, when I ask for her crust recipe she says, "oh, it's so easy" but has never shared it :) Thank you, thank you and thank you. I am going to pin this post and bookmark it, as well as put this recipe into my favorite recipe notebook. 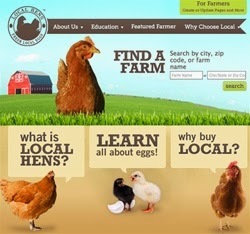 I was planing on visiting a near by orchard tomorrow, so this is so timely. Did I say, "Thank "You"? Hi Connie! Nice to hear from you. Glad you're going to try the crust :-) How cool that you have a favorite recipe notebook. Hope you picked some super apples. Have fun pie baking. 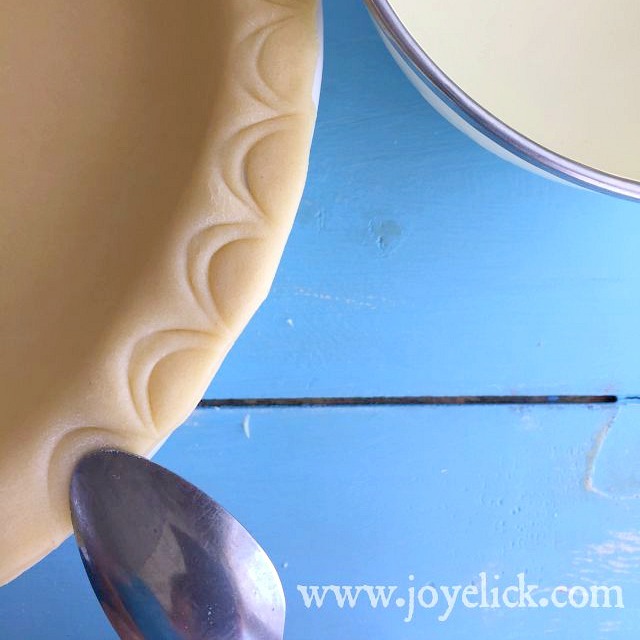 I have been looking for a perfect pie crust recipe, and would like to admit that this recipe is excellent! I'll give it a try! Thanks a lot for sharing! wow more of experience in cook. this really looks hard, how do you do this. Amazing Share.